IComponent2::Name2 SOLIDWORKS API property provides get and set accessors for reading and changing the component name respectively. This function returns different names structures when setting or getting. That means if it is required to rename component using its original name (i.e. add suffix or prefix) value returned from get-accessor needs to be altered. When get accessor is called full name of the component is returned, while set accessor only requires short name. 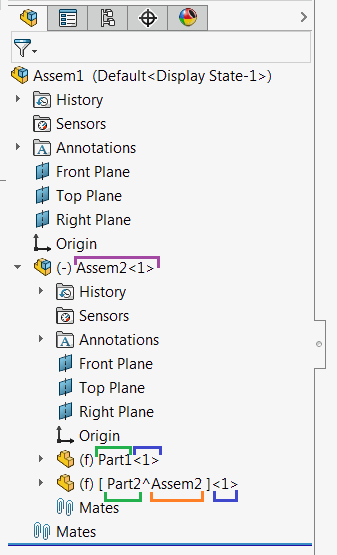 Example below renames any selected component (root level, component in sub-assembly and virtual) using SOLIDWORKS API by adding the suffix to its name. Const SUFFIX As String = "_Renamed"
MsgBox "Please select component to rename"
MsgBox "Please open assembly document"